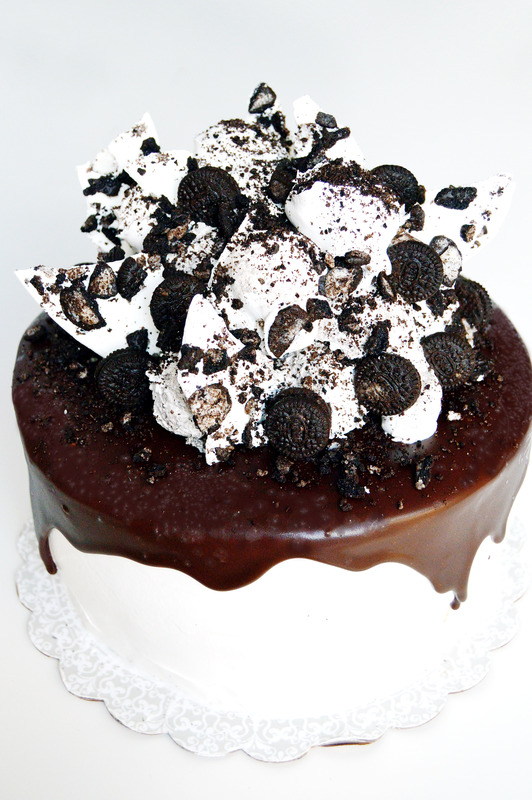 I would say that whenever the topic of ice cream cakes come up, about 75% of the people I talk to gush about how much they love crunchies. You know, the crunchy chocolate crumbs that are usually sandwiched between the vanilla and chocolate ice cream layers in a standard store bought ice cream cake. So when D requested a cookies and cream ice cream cake, with an extra thick layer of crunchies, I set out to make the ultimate cookies and cream ice cream cake. On another note, I’m not sure if it is cookies n’ cream, cookies n’ creme, cookies and creme, cookies and cream or Oreo. Does anyone know what the “right” way to say it is? The grammar Nazi in my brain says “cookies and cream” but the media uses all of them. So instead of driving myself crazy, I’m going to use them all interchangeably. It starts with an Oreo brownie base, layered with homemade crunchies (just two ingredients, and so easy), with a very generous layer of cookies and cream ice cream (two quarts! ), layered again with crunchies and brownie base. 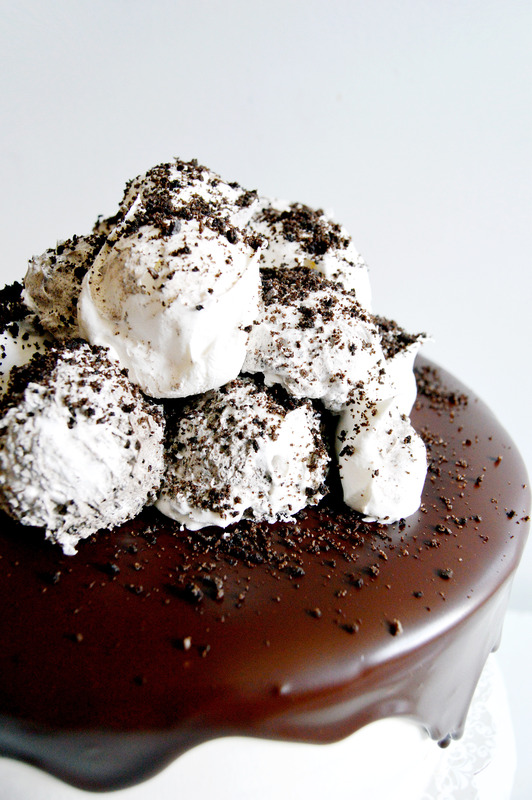 It is then covered in whipped topping, topped with a decadent chocolate ganache (Omg. 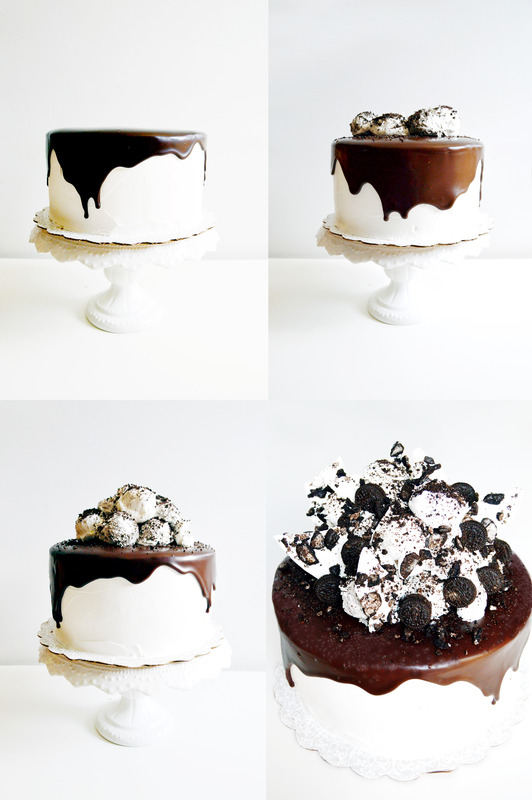 It was my favorite part of the cake), and decorated with scoops of whipped topping that look like scoops of ice cream (plain and Oreo flavored), and topped with shards of Oreo bark, cookie crumbs and whole mini Oreos. Every single component screams cookies and cream and every bite is as amazing as it sounds. Line two 8-inch cake pans with plastic wrap. 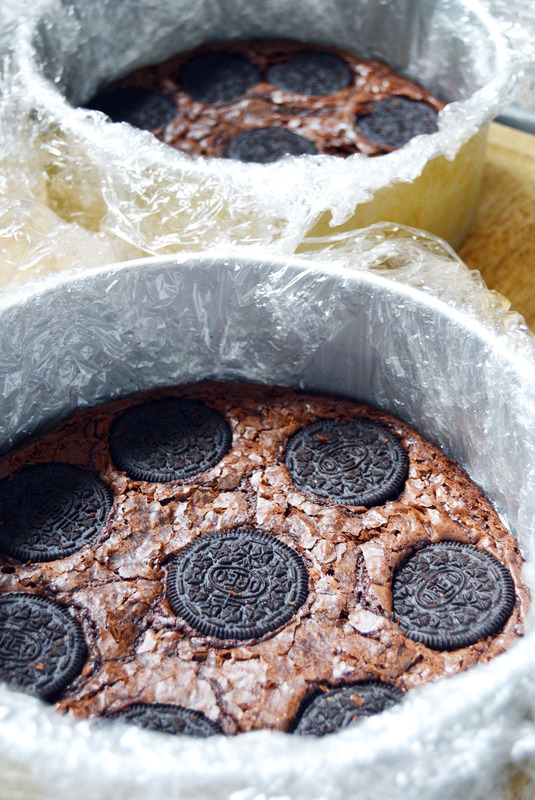 In each pan, put in one Oreo brownie layer. Split the batch of homemade crunchies in half and spread each half on top of each Oreo brownie layer. Layer a quart of cookies and cream ice cream in each cake pan, smoothing the top. Top with plastic wrap and freeze until completely frozen, either over night or 8 hours. Unmold each cake pan carefully and sandwich the two layers, the ice cream layer meeting in the center and brownie layer facing outwards. Refreeze in freezer for 10 minutes. Frost the outside of the cake with cool whip. Refreeze in freezer until cool whip is firm. Crush some mini Oreos and mix Oreo crumbs in half of the remaining cool whip. Leaving the other half plain. Once cool whip has set, smooth ganache over the top of the cake, letting it drip down the sides. Sprinkle some cookie crumbs on top of ganache before it sets. Place cake in freezer until ganache is completely set. 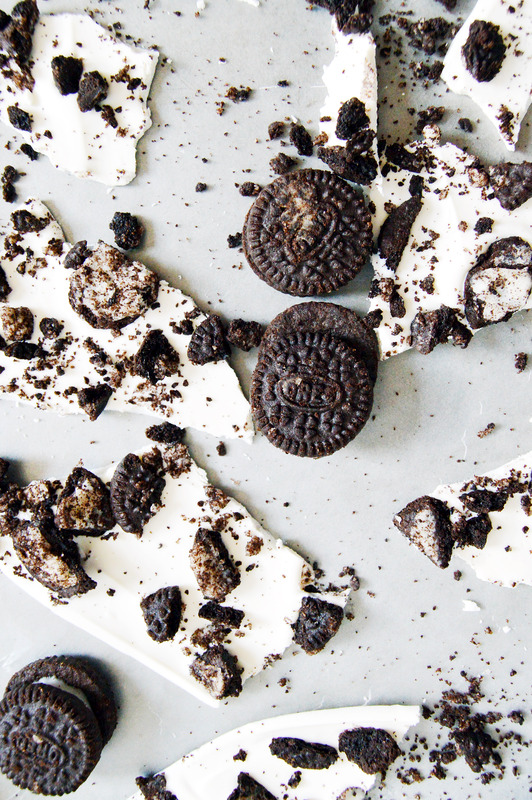 Using a cookie scoop, layer alternating scoops of Oreo and plain cool whip, sprinkling with cookie crumbs as you go. Freeze to set. While ice cream is freezing, melt white chocolate/candy melts in a microwave safe bowl being careful not to burn the chocolate. Line a small sheet pan with wax paper and smooth the melted chocolate evenly using an offset spatula. Top with crushed mini Oreos, and whole mini Oreos. Put in freezer to set. Break chocolate into shards and reserve for cake. 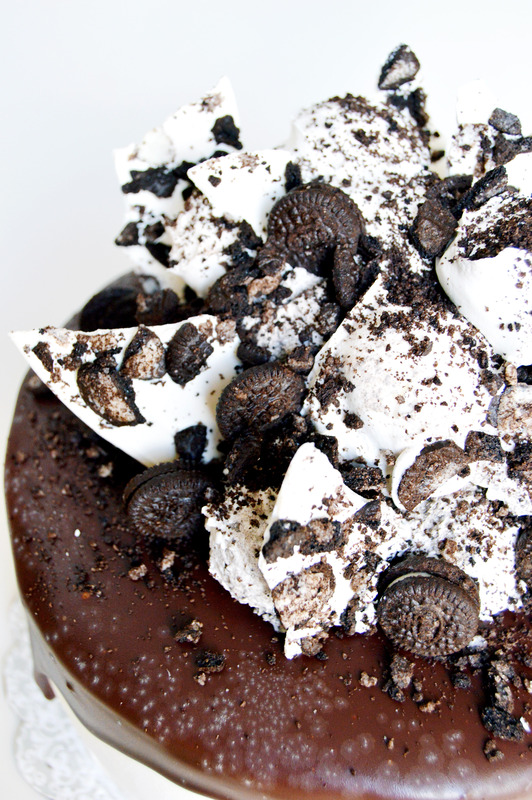 Once the ice cream cake is set, remove cake from freezer, and decorate the top with the white chocolate shards and top with extra mini Oreos for a grand effect. Prepare two 8-inch cake pans by spraying with nonstick spray and lining the bottom with parchment paper. Mix brownie batter according to package and divide evenly between two cake pans. Place 7 Oreos in a circular formation in each pan, and Oreo in the center. Bake half of the time said on the package. Let cool and reserve for cake. Using a food processor, Crush Oreos into even crumbs. In a medium bowl, mix cookie crumbs and ice cream topping until each crumb is well coated. *I’ve said it before and I’ll say it again, you want to use the premium stuff for ice cream cakes. Because the higher quality ice cream has less air content, it will melt slower. I used Trader Joe’s Joe-Joe’s n’ Cream. **Yes, I shun cake mixes, but brownie mixes are pretty good in my book. I’m in love with the Ghirardelli brand mixes. Plus, when making a cake with this many components, simplifying any part is worth it. ***Homemade crunchies recipe from Our Best Bites. This entry was posted in Birthdays, Cakes, Chocolate, Cookies, Cookies and Cream, Desserts, Ice Cream, Vanilla and tagged birthday, Cake, chocolate, cookies and cream, cookies n creme, cookies n' cream, dessert, Ice Cream, ice cream cake, vanilla. Bookmark the permalink. Oh my goodness…. that looks so good! You did such a great job on it! I mean..wow! That’s like a piece of art, and I’m not even a huge fan of oreos!